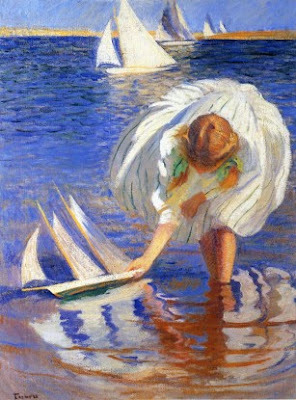 I love this magical painting by American Impressionist Edmund Tarbell (1862 - 1938). I could look at it, very pleasantly, for hours. The contrast of the blue and white mainstay colors of the piece is brilliantly done. Watery reflections are SO hard to 'get' right, but these are just perfection. I also love the sense of quiet. For me this looks like a captured moment of absolute bliss. To read about Tarbell, who was born in New England and studied in Paris, please use this link. I didn't see all of what you saw in this painting until I looked at it several times, then read your comments. I think it takes an artist, someone with a great visual sense to see the finer points in a painting. I see a nice, pleasant painting of a person, a body of water and sailboats. Now I see more.